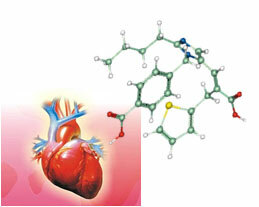 The main research activities of the Molecular Analysis team lay on 2 pillars. 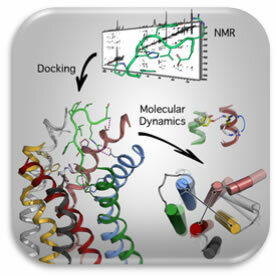 In the field of drug development, the team applies Bio-NMR and Biomolecular Modeling approaches towards the design of novel bioactive compounds targeting diseases of high socioeconomic interest. Moreover, the group applies metabolomics using high throughput analytical platforms as NMR and LC-MS in combination with biostatistics with applications in biofluids and added-value natural products. Drug-membrane interactions by applying various biophysical methods (NMR in liquid/solid phase, SAXS, DSC) and in silico approaches in membrane modeled systems. 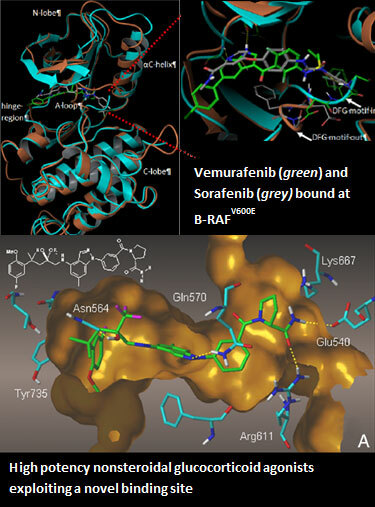 Our research work focuses on the elucidation of the conformational features and the binding modes of AT1 antagonists and renin inhibitors. Lately, we have gained insight into AT1 receptor activation through AII binding and MD simulations. Moreover we have been focusing on drug-membrane interactions by applying various biophysical methods and in silico approaches in membrane modeled systems. Our studies have provided for the first time, strong evidence for the spontaneous insertion of losartan, the prototype of the sartan family, in the lipidic core thus probing to a membrane mediated pathway towards the AT1 receptor besides the random encounter at its extracellular part. Combination of NMR, molecular docking and MD simulations revealed major activation elements of the AT1 receptor. Membrane acting as a trap for the free drug molecules. 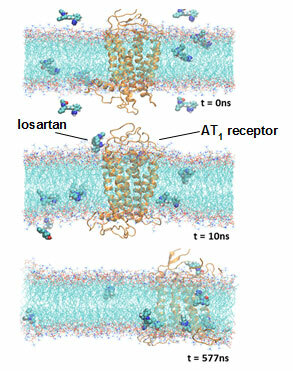 MD simulations indicated spontaneous insertion of losartan, the prototype of the sartan family, in the lipidic core probing to a membrane mediated pathway towards the AT1 receptor besides the random encounter at its extracellular part. Bioorg. Med. Chem., (2008), 16, 1150-1161; Chem. Pharm. Bull., (2010), 58(2), 160-7; Bioorg. Med. Chem. 18, (2010), 426-432; Bioorg. Med. Chem., (2012), 20 1569–1583. This study applies biomolecular NMR to identify odorants interacting with the olfactory system of the malaria-transmitting mosquito Anopheles gambiae seeking for new repellents with enhanced potency and selectivity. 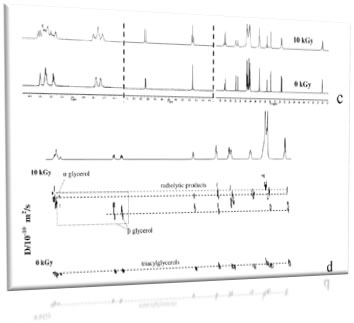 Our initial NMR-based screening approaches (1H STD-NMR) monitored binding interactions between Agam OBP1 and compounds from natural sources or synthesized ones. We proceeded with 15N/13C labelling of OBP1 protein and backbone residual assignment by 3D NMR. This enabled us to apply chemical shift mapping experiments (15N-HSQC) in order to recognize the binding regions and binding modes of the identified ligands. This information can further assist the design of optimized compounds showing improved interactions with the protein target. A series of hydrazides and aldehydes were used for the dynamic formation of an acylhydrazone library. 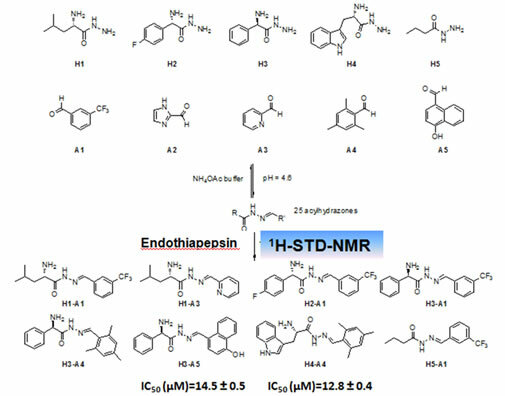 Enzymatic selection of the best inhibitors to endothiapepsin, a model system for aspartic proteases, was implemented by 1H-STD-NMR analysis. The potency of the identified by 1H STD acylhydrazones inhibitors was further verified from the HIV protease in vitro assay. 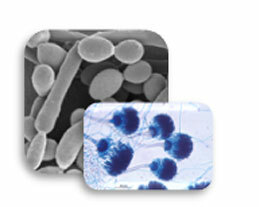 Laurencia alga consists a prolific source of metabolites exhibiting antibacterial, insecticidal and cytotoxic activity. 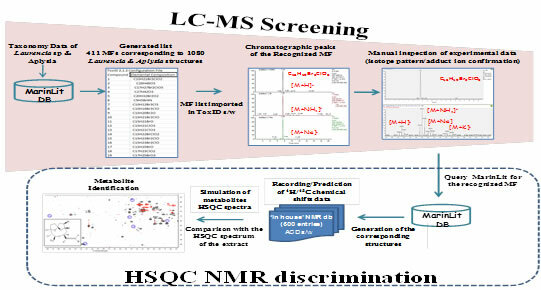 In this project, the global metabolic profile of Laurencia crude algal extracts was addressed by applying high throughput analytical techniques, (UPLC-Orbitrap-MS) and (2D HSQC) NMR spectroscopy. An integrated platform including sophisticated s/w tools and databases has been developed to mine the complex analytical data, identify known metabolites and trace the presence of new natural products. This combined screening strategy can be effectively used as a tool for targeted isolation of new metabolites. Moreover, an in house library of Laurencia metabolites has been developed which can be used for virtual screening purposes against biological targets. 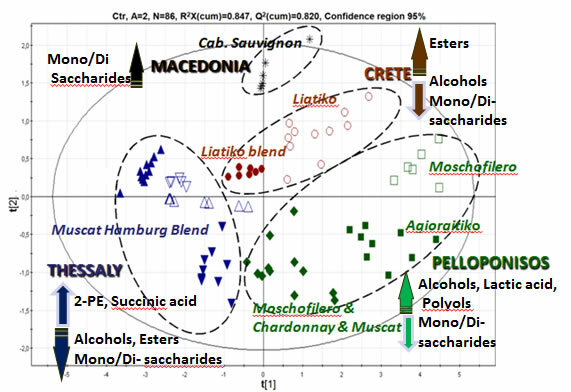 In practice, such results could be applied to fortify the authenticity claim of a product. 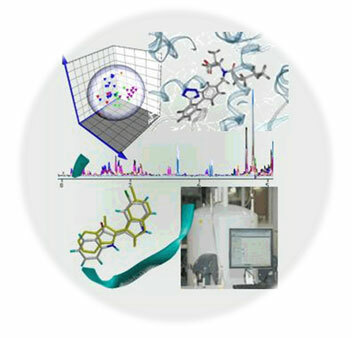 This project refers to the application of NMR techniques and NMR based metabolomics on irradiated food. Currently, there is a need for the development of efficient and reliable techniques to detect imported food items processed with gamma irradiation but which do not bring the appropriate labeling. 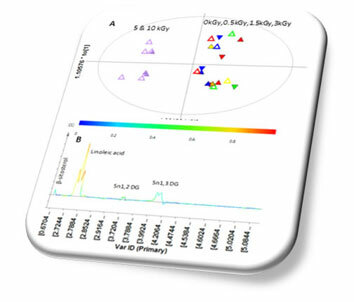 1H DOSY as well as fast NMR profiling of the lipid fraction of food items have provided very promising results for the future development of a detection methodology even at low irradiation doses. Under this project, several high energy extraction techniques (Microwave Assisted Extraction –MAE and Ultrasound Assisted Extraction-UAE) have been applied towards the fast isolation of the lipid fraction from selected food products. NMR food-omics on lipid fraction of macadamia nuts has been proposed as a fast discrimination methodology between irradiated samples at high (>5kGy) doses. «Functional and Potentially Hazardous Food Constituents. Impact of Electromagnetic Treatments for Quality Products» Programme ARHIMIDES 2012-2015, SECTORAL OPERATIONAL PROGRAMME, EDUCATION AND LIFELONG LEARNING –ESPA 2007-2013 (Member of the main research team). "STHENOS-KRIPIS: Targeted therapeutic approaches against degenerative diseases, with emphasis on cancer and aging", NSRF 2007-2013. Discrimination between term infants with normal (Appropriate for Gestational Age) and increased (Large for Gestational Age) fetal growth. 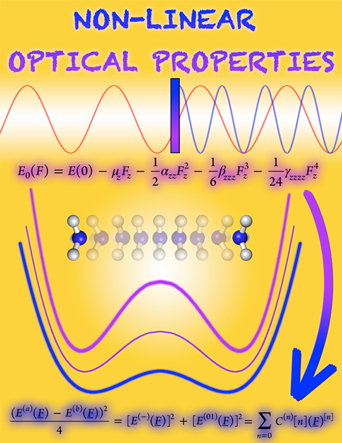 Theoretical prediction of linear and nonlinear optical (NLO) properties of molecules, nanomaterials and condensed phases. In an effort to develop efficient methods to compute the NLO properties of materials, we have developed and implemented an approach for the computation of the NLO properties of molecular crystals, liquids and polymers. We are trying to extend these methods to novel materials, like nanomaterials, which show very promising NLO properties. I'm also working on developing methods for the accurate determination of the vibrational contributions to NLO properties, with special emphasis on molecules exhibiting large-amplitude motions, such as the umbrella motion in ammonia. Application of accurate ab-initio methods to large-scale problems involving bioactive compounds. 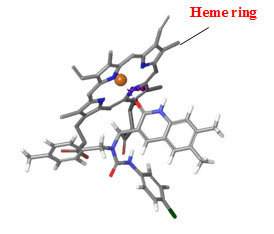 Examples include the application of the effective fragment potential (EFG) approach to the elucidation of the binding mechanism of renin, or the use of the fragment molecular method (FMO) to the investigation of the interaction between fullerenes and human serum albumin.